The Coast Guard suspended its search efforts Thursday for the two remaining people who were aboard a small medical plane that crashed in the Atlantic Ocean off Fort Lauderdale. "The United States Coast Guard and our partners express the deepest condolences to the friends and families who lost loved ones in this tragic incident," said Capt. Todd Lutes, the chief of the agency's incident management branch. "The Coast Guard will continue to assist the National Transportation Safety Board in their investigative efforts." Crews had been searching for two possible survivors since the Mexican-registered Learjet 35 went down shortly after taking off from Fort Lauderdale-Hollywood International Airport Tuesday night. The bodies of the two other people who were aboard were found that night about three miles off the coast of Fort Lauderdale. Crews continued to search Thursday in the aftermath of Tuesday's crash, which killed two people and left two others missing. 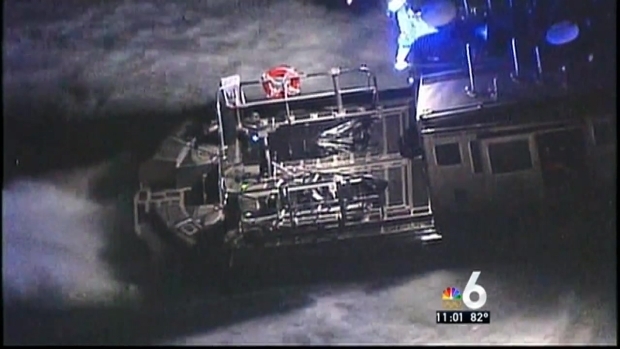 NBC 6's Willard Shepard takes a look at the model of plane that went down. The jet, run by AirEvac International, was carrying two pilots, a doctor and a nurse who were returning to Cozumel, Mexico. A statement from Mexico's Directorate General of Civil Aeronautics identified the pilots as Jose Hiram Galvan and Josue Buendia Moreno, and the passengers as Fernando Senties Nieto and Mariana Gonzalez Isuna. Coast Guard officials confirmed that the pilots and passengers are Mexican citizens. Francisco de la Lama, the deputy general consul of Mexico in Miami, said family members of all four victims have come to South Florida. "As you can imagine, they're very devastated," de la Lama said. The Coast Guard and other agencies searched about 4,000 square miles for the two remaining people and debris from the crash. Crews continued to search the Atlantic Ocean off Fort Lauderdale Thursday for possible survivors of a small medical plane that crashed into the water, killing two and leaving two others missing. NBC 6's Julia Bagg reports. More than 1,000 pounds of debris has been recovered, but the Coast Guard said late Thursday afternoon that it has suspended search and rescue operations until new evidence is presented. NTSB senior air safety investigator Brian Rayner said it's still unclear what caused the crash. Of the debris that's been found, there's no evidence of a fire, he said. Everything seems consistent with a water impact, but neither engine has been recovered. No flight recorder has been recovered, and officials haven't been able to determine whether the plane had one. "At this stage in the investigation, what I'm interested in is the gathering of evidence," Rayner said. "The more we gather, the more we can rule out." Members of the Coast Guard, Broward Sheriff's Office, Fort Lauderdale Police and Fire Rescue and the Florida Fish and Wildlife Conservation Commission had been participating in the search and rescue efforts, Coast Guard Chief Petty Officer Ryan Doss said at a news conference Thursday morning. Doss said crews had searched more than 4,000 square miles of ocean, about the size of the state of Delaware. He said crews were dealing with choppy weather and the debris field, which continued to move north and has been spotted as far away as Jupiter Inlet. The Coast Guard is continuing its search for possible survivbors of a medical plane that went down in waters off Fort Lauderdale. Chief Petty Officer Ryan Doss comments. "It is a unique challenge in a case like this where you have what equates to a moving accident scene," Doss said. The search extended as far south as Hollywood. Some objects were spotted underwater but due to bad weather, crews were unable to get to them, Doss said. NTSB investigators are using the wreckage that has been recovered to start to try to piece together what happened, Doss said. "We believe there is a lot more of it out there somewhere. But again, we have searched a very extensive area with no sign of it," Doss said. Anyone who spots debris either on shore or while boating is asked to call local authorities. 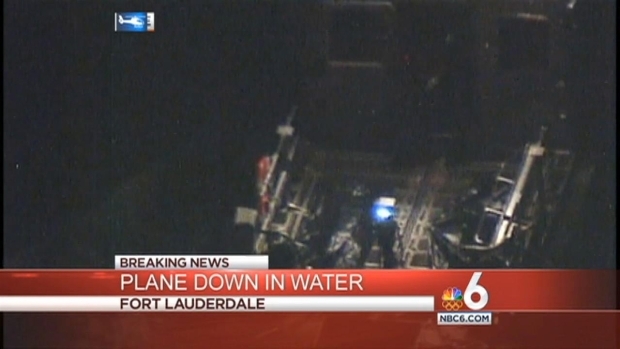 Two bodies have been found after a small plane with four people aboard crashed in the Atlantic Ocean about three miles off the coast of Fort Lauderdale Tuesday night, authorities said. 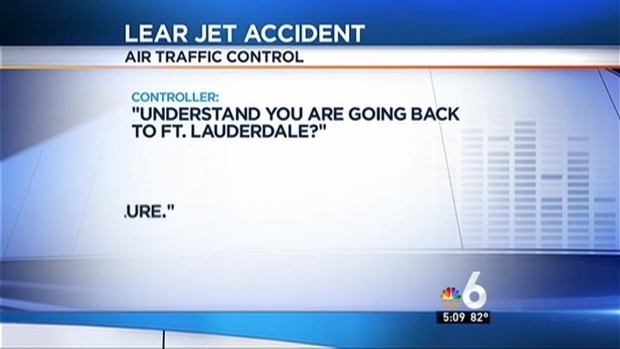 NBC 6's Justin Finch reports.